A 2011 documentary about women veterans will air tonight, Fri., Nov. 8, 2013 on Public Broadcast Service television stations nationwide, via the PBS World service. 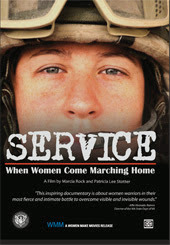 According to the PBS website, "Service: When Women Come Marching Home" will also be available for on-line viewing free during the month of November. The documentary by Marcia Rock and Patricia Lee Stotter describes the post-deployment experiences of eight veterans, who served in the Cold War and the Persian Gulf, to present-day Iraq and Afghanistan. From the deserts of Afghanistan to rural Tennessee, from Iraq to New York City, these women wrestle with prosthetics, homelessness, Post Traumatic Stress Disorder and Military Sexual Trauma. Their pictures and videos shot in Iraq and Afghanistan speak volumes. Told through their voices during everyday life in kitchens, grocery stores and even therapy sessions, the documentary is a wake-up call to the unknowing civilian population to the challenges female veterans face returning from duty. Distribution via PBS was underwritten by the Disabled American Veterans (D.A.V.) organization. For a PBS station-locator, click here. A PDF broadcast schedule is available here. For the official "Service" documentary website, click here. For a Facebook page for the documentary, click here.